On arrival at Station 44 the kids and Mamma were in awe of the beautiful big shiny fire trucks that live here. These vehicles whizzing past you in the street is exciting enough and they are even more impressive and awe inspiring up close. Our firefighter host described the different uses for the variety of fire trucks they have here at this fully operational facility, and you will be given you a safety briefing just in case the firefighters are called to duty, which can and did happen on our visit. 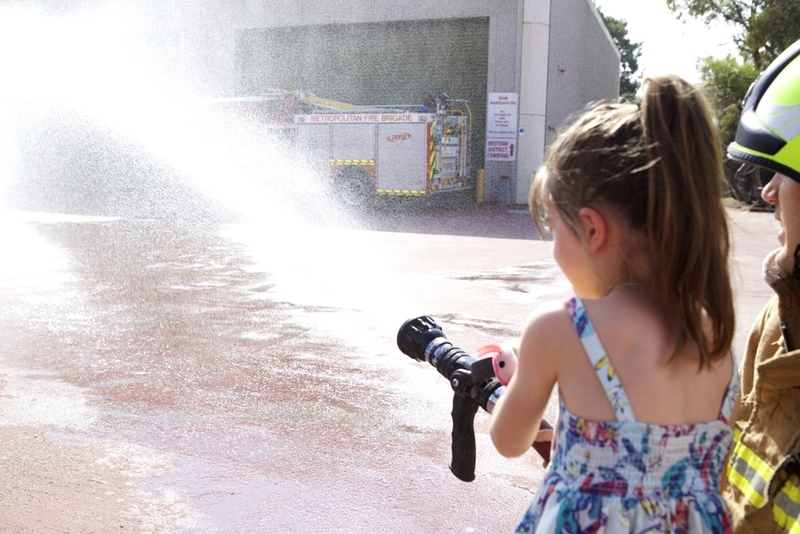 During the display you and the kids may see firefighters extinguish an actual fire, have a go on the fire hoses, dress up as junior fire-fighters, and have a look inside a truck. Mamma and the crew witnessed the 'jaws of life' cutting a dummy from a car in a 'crash scenario' done by a highly skilled accident response team. This is an exciting, inspiring and very informative way to spend an hour and a great reminder about the dedication our firefighters have to save and protect lives. Please note that during the display the Fire Station will be operational and may be required to attend a call. If this requires the attendance of all station personnel you may have to vacate the premises. Please take this into account when making arrangements.